Max Rhode, now a senior at Carleton College, participate in the IRIS Internship program during the summer of 2016. 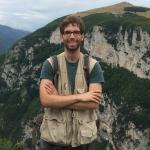 During the summer he worked at the Albuquerque Seismological Lab, collaborating with his mentors Adam Ringler (USGS) and David Wilson (USGS) to explore a fundamental problem in seismology. Specifically they wanted to see if they could remove local rotation motions caused by local pressure fluctuations. If these signals could be removed they would be able to better use horizontal seismic data to identify new types of seismic waves and use these waves to better understand the structure and composition of the Earth. The results of their work have recently been published in the Seismological Research Letters. Please join us in congratulating Max, Adam and David on their work!